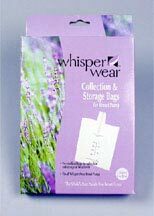 Whisper Wear Collection Bags hold mother�s breast milk expressed using the Whisper Wear Breast Pump. Durable enough for refrigeration or freezing, each sterile, 4 oz. bag has both oz. and cc markings. No-Spill feature allows you to handle the bag, or even lay it down, without fear accidental spillage prior to sealing. Easy, tear away spout opening and quick tape closure. The Collection Bag, along with the Breast Cup, Stem and Valve, creates a closed environment for pumping directly into the Collection Bag without encountering room air contaminants. Can be used with other pumps as well. Use a funnel to transfer breastmilk for storage in the freezer. Much cheaper than other breastmilk collection bags!! !